Ad Hoc Committee on Identifying and Disseminating Effective Analytics. Ad Hoc Committee on the Value of Higher Education. Ad Hoc Committee on the Value of Colleges and Universities. The committees typically serve for one to two years to address priority issues identified by the membership. Committee members meet in conjunction with regularly scheduled board meetings, supplemented with conference calls, to accomplish their objectives. The outcomes of these committees will likely be the topics of future Business Officer articles. For more details, contact Bill Dillon, executive vice president. 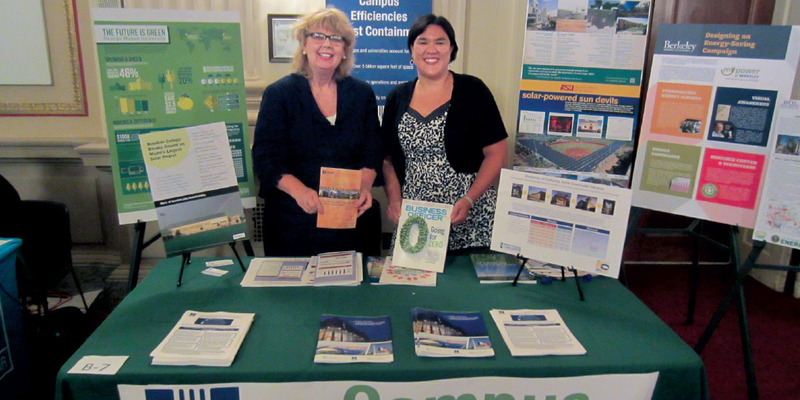 NACUBO staff recently participated at the 17th Annual Congressional Renewable Energy and Energy Efficiency Expo + Forum at the Cannon House Office Building, Washington, D.C.
Sally Grans Korsh, director, facilities management and environmental policy, and Liz Clark, director, congressional relations, highlighted the areas of energy efficiency and renewables at the event held on July 31. More than 80 organizations and consultants attended the one-day expo that showcased eight panel presentations on energy policy issues. This was the first time that NACUBO, or any other higher education association, has participated in this event. Several legislative staff and interns discussed the contributions that NACUBO members are making in renewable energy and efficiencies. Grans Korsh and Clark shared with attendees a white paper, “Higher Education: Leading the Nation to a Safe and Secure Energy Future.” It is available online by clicking on Sustainability under the Business Policy Areas tab on the NACUBO website at www.nacubo.org. 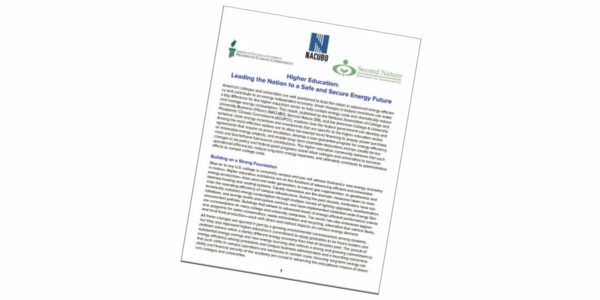 NACUBO is seeking proposals that offer in-depth and practical knowledge on issues facing the higher education industry today. Members can submit proposals to present a concurrent session or a corporate showcase at the NACUBO 2015 Annual Meeting, July 18–21, Nashville. Submissions should showcase solutions, initiate provocative discussions, and share effective strategies to tackle challenges. Proposals must be submitted online before Oct. 14, 2014. For more information, visit www.nacuboannualmeeting.org. The Campus Environmental Resource Center (CampusERC) website, originally launched in 2007, has undergone a significant redesign to offer easier access to multiple parties from different interest groups in both the K–12 and higher education spheres. Available at www.campuserc.org, the website is a library of resources that support campus environmental performance improvement. Developed collaboratively by NACUBO, C2E2, CSHEMA, APPA, and the EPA, its primary audience is staff, administrators, and faculty who are looking for resources to better understand environmental regulations, find relevant contacts, seek model practices, track news, or build and manage better environmental programs. The website has been configured so that users can easily access information from a computer, laptop, or mobile devices, including smartphones and tablets. The headings are now organized to allow users quicker access to information. While the initial funding from EPA no longer exists, NACUBO will continue to sponsor updates to the site to share vital information. NACUBO recently held webcasts on several topics of interest to business officers, such as shared services, tuition assessment and restructuring, and budgeting and forecasting. Are Shared Services Right for Your Organization?—The KU Journey. In 2011, the University of Kansas, Lawrence, undertook an initiative to improve services and reduce costs across administrative functions. It implemented a network of eight regional shared service centers to provide human resources, accounting, and research administration services. Speakers from the university and Huron Education discuss the rationale for the implementation, and examine barriers to and enablers for success. Strategic Tuition Assessment and Tuition Restructuring. In 2011, the Virginia Commonwealth University, Richmond, Virginia, worked with the Huron Consulting Group to assess its tuition base and the impact of several new pricing structure options to improve revenue while also improving student success. The university implemented a credit hour–based tuition structure for incoming students in 2013. Speakers discuss the alignment of resource needs with VCU’s strategic goals, the steps necessary to prepare for a change in tuition structure, and the team required to make such a change. The Best Practices for Budgeting and Forecasting in Higher Education. During this webcast, speakers discuss how finance professionals at University College London, United Kingdom, are not only managing costs, but leveraging analytics and insightful reporting to make strategic, data-driven decisions across the institution. Learn how improved planning, analytics, and reporting can drive improved decision making at institutions. The webcasts will be available on demand for a year. For more information, visit the On Demand section of the Distance Learning page at www.nacubo.org.